Uh oh--the Check Engine light is on. What's wrong? What's my car trying to tell me? Do I need to do something right now and take it into auto repair? Fear that Check Engine light no more! The FIXD OBD-II Gen II Active Car-Health Monitor translates your car's Check Engine light into simple, understandable terms. No more confusing technical definitions, just the information you need to know. This 2-part system of sensor and app works with any gas-powered vehicle, model year 1996 or newer. The sensor plugs into your car's OBD-II port. The free FIXD app for Apple and Android smartphones talks to the sensor via Bluetooth. Just get in your car with your smartphone and FIXD is ready to go! You can even install a FIXD sensor in each family member's vehicle to remotely monitor the health and status of their vehicles too, because the FIXD app allows you to monitor every FIXD-equiiped car in the family from your smartphone. FIXD also provides reminders for upcoming suggested maintenance as well as displays the scheduled maintenance for your make/model/year/engine as suggested by the car manufacturer. Don't let your car engine light scare you. Know if the problem needs urgent repair or if you can keep driving. FIXD--the easiest way to &quot;speak car&quot;! Uh oh--the Check Engine light is on. What's wrong? What's my car trying to tell me? Do I need to do something right now and take it into auto repair? Fear that Check Engine light no more! The FIXD OBD-II Gen II Active Car-Health Monitor translates your car's Check Engine light into simple, understandable terms. No more confusing technical definitions, just the information you need to know. This 2-part system of sensor and app works with any gas-powered vehicle, model year 1996 or newer. The sensor plugs into your car's OBD-II port. 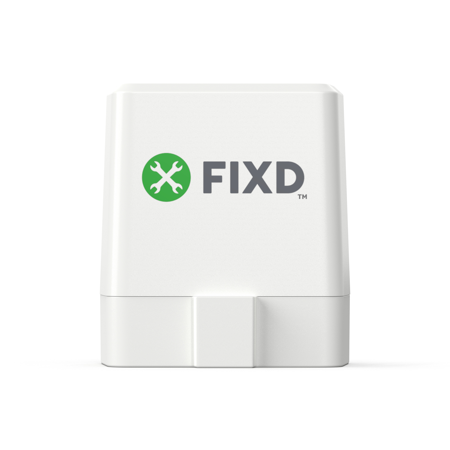 The free FIXD app for Apple and Android smartphones talks to the sensor via Bluetooth. Just get in your car with your smartphone and FIXD is ready to go! You can even install a FIXD sensor in each family member's vehicle to remotely monitor the health and status of their vehicles too, because the FIXD app allows you to monitor every FIXD-equiiped car in the family from your smartphone. FIXD also provides reminders for upcoming suggested maintenance as well as displays the scheduled maintenance for your make/model/year/engine as suggested by the car manufacturer. Don't let your car engine light scare you. Know if the problem needs urgent repair or if you can keep driving. FIXD--the easiest way to "speak car"! This device is great. Fortunately I rarely have to fight with a check engine light, but when I do, now I'll know what the problem is. I think that the biggest benefit to this product is that you can sync multiple vehicles to one account. Now my husband gets alerts when my car is due for routine service, and can assist with taking care of it - since I really don't enjoy that! Like I said, it keeps me hands free! I try the Fixed diagnostic reader I was actually surprised. this thing actually works.!! I already knew what was wrong with my car. so I test it out just fine if it would give me the same answer that I already knew. it turned out to be right it was a thermostat that needed to be replaced. it goes even farther than that it gives you a code. Fixed send to your email you open your email. open your email there is a professional mechanic telling you what the code means and what you need to do to fix the problem. I was very impressed very glad I bought it. I think everyone should buy it as well. oh yes it will ask you do you want to turn off check engine light and you can. I love it because I am a single woman and I don't know much about cars. This gadget saved me at least $95. for mechanic to diagnose why my engine light came on. It told me 80% of the time people with my problem could solve it by buying a new gas cap. I did and it worked! No telling how much money that could have cost me without FIXD. It gave me a diagram of possible problems and explained it simply to me. I don't feel like I will be able to be taken advantage of like I have before from ignorance of mechanical things. Great product. Honest truthful event; bought a 2012 compact style car. Used FIXD device prior to purchase. Nothing at that time. Not sure why but after some highway mileage, issues with transmission appeared. Used Fixd device again and it instantly indicated level 5 error tied to a sensor. Brought vehicle back and returned it. Had I not had device, may have been stuck with major repairs. Dont get ripped off by mechanics! I got a quote for my car at my local repair shop for close to $800. I saw this in an ad online and gave it a shot. Turns out there was an unplugged wire under the hood of my car and I fixed it for free. Does it only work when the check engine light is on? 1. Yes, this model is for when the light is on. Will this tell you what's wrong when ABS light or Stabilitrak lights come on? 1. No, this will not tell you why ABS or Stabilitrak are on. Will this product work on my 2000 Mercedes Benz My car will not come out of park Will this tell me why? 1. If your check engine light is ON and you can not take it out of Park..PUT your foot on the brake and see it it comes out of part. ( safety sensor should de-activate) and you be able to shift. it not your scanner should show a error code.